What if I want to return my item(s)? *Our return policy is for store credit only. Please be aware that all sale items & style boxes are final sale. There are no exceptions to this. All returns must be postmarked within 10 days of receipt. Sale items and discounted items are final sale with no exception. If you used a discount code of any sort, this item is considered final sale. We do not accept returns on: jewelry, accessories, or intimates (bandeaus, swimwear, bralettes, etc). Since we ship for free, original shipping fees are non-refundable & return shipping is the responsibility of the customer. We inspect all items thoroughly prior to shipping, but if you receive a damaged item, please notify us within 3 days of receipt. We absolutely want to make it right! Exchanges and refunds on damages will be handled on a case by case basis as to avoid abuse of the policy. We encourage you to use a trackable return shipping method to avoid items being lost in transit. Because we always ship free to you, we do not offer free returns1. If you would like us to send you a shipping label, we will. We will take the shipping cost from your store credit. ALL ITEMS IN A STYLE BOX ARE FINAL SALE. ALL STYLE BOXES ARE FINAL SALE. ALL GRAB BAGS ARE FINAL SALE. IF YOU USE A DISCOUNT CODE, ITEMS IN THAT ORDER OR FINAL SALE. 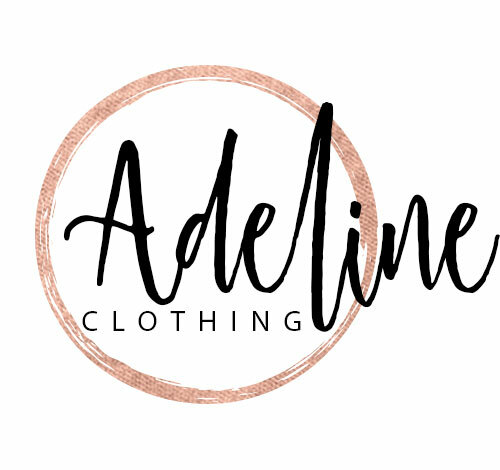 All final sale items or returns made outside of the return window are subject to a 10% restocking fee or return denial based on Adeline Clothing's discretion. * Since we always ship to you for free and never charge a restocking fee, you are responsible for return shipping. For returns, ship the item back to the address below. Using it’s original packing and going to the USPS (post office) will be your cheapest option and definitely hang on to the receipt with the tracking number, just in case! You can use anything to ship it back in, that is just our preferred method. If we approve a shoe return, make sure the box is protected and not used as a shipping box. We can also email you a shipping label that you can print out, attach to the packaging, and put in your mailbox. For that option, we will subtract $5 from your store credit. Flash Sale codes have no customer limits. Orders placed in the same shipping windows will be combined for efficient shipping. All promotional codes/gift card codes have a one per customer limit. Abuse of this policy subject to order cancellation. * Just a reminder: sale items, jewelry, and intimates are final sale.